It's another Monday and you know what that means. Don't you? 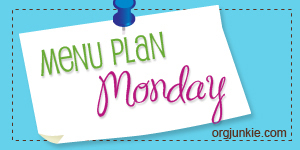 It's time for a Menu Plan! I actually got mine done yesterday instead of last minute this morning. That was a first. I used a bunch of the meal plans at I'm an Organizing Junkie from last week to inspire me and even to get a few recipes. Before I launch into the actual meal plan I want to share a few notes about the menu last week. First, as you can see above, I made the pumpkin muffins. They were pretty good, but Pat would have preferred them a little sweeter. I also ended up doubling the recipe . . .on accident. See, I was rushing that morning to get them made and instead of adding 1 CUP of the pumpkin, I added 1 CAN. Fortunately, I realized this before I tried to bake them. With a few slight adjustments (adding more of the other ingredients), I made enough to use my mini bread loaves for some pumpkin bread or pumpkin muffin bread or something whatever. Anyway, now I have a whole freezer of pumpkin bread-stuff! I'm just glad I realized my mistake before it cost me. It was a definite reminder to always read and re-read those recipes. Second, the Lemon Basil Chicken Pasta from The Pioneer Woman was TO DIE FOR!! I can definitely understand why she uses it as a summer dish. The lemon gives it a distinctly summery feel, one that wouldn't be as. . . warming on chilly nights. On the other hand, since we're still seeing bits of warm weather here, it worked out just fine. I loved it SO MUCH! In fact, I'm looking forward to eating the leftovers from it for lunch today. We've got a busy week and a busier weekend. Pat's twentieth reunion is this weekend. We're still not sure if we are hitting up the festivities or not, but we want to catch up with some of his friends that are coming in from out of town for it. I guess it's a good thing that we live in the same town he did in high school. . .
Plus, it being fall, there's always a football game to watch! Don't forget to head over to I'm an Organizing Junkie for more menu plans and meal ideas!! Looks good, I am going to borrow some of these for the week! 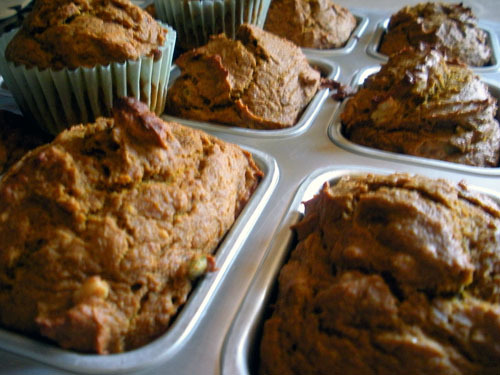 If I had known about the pumpkin bread on Friday I would have had you bring me some to try! You are making me so hungry, Hope! You're an inspiration to me--we tend to fly by the seat of our pants around here, but I would aspire to be more organized and get more done. You can send some extra pumpkin bread my way, lol! GDG - feel free, that's why I'm posting it. I've found that meal ideas are some of my favorite things to peruse on the internet. So, sharing mine feels like giving back! Heather - I didn't even think about it. I just threw it all in the freezer. Maybe another time! Joani - I can't be spontaneous with meals anymore. I was going to the store EVERY DAY and that just wasted gas. As well, when I tried to just buy what's on sale or random groceries, I never seemed to have all of what I needed for a recipe. And that was disappointing. So, meal plans work for me. At least until the future gets here and we get those pills that are a meal all-in-one! Oooohhh omelettes! Haven't made those in forever! Thanks for the idea! Hayley - go for it girl!! I make omelets almost every week since there's such much variety to what you can stuff in them. Plus, hubs and I only eat our eggs in an omelet or scrambled. I know, we're boring! Thanks for linking to my chicken corn chowder! Hope you enjoyed it!